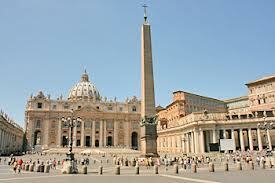 Why is there an Egyptian pagan obelisk at the center of St. Peter’s square? That’s a question some pilgrims may wonder about when visiting the Vatican. This tall monument standing today at the center of St. Peter’s Square was erected in Heliopolis, Egypt, more than 1800 years before Christ and was dedicated to the sun. The Roman Emperor Caligula brought it to Rome in 37 BC and placed it in the middle of a circus he built in the Vatican meadows. This circus later became Nero’s circus, the place where St. Peter was crucified upside down. This obelisk probably would have been one of the last things St. Peter saw before he was killed there. In 1586 it was moved by the Catholic Church a few hundred meters to its present location where it plays an important role in the theological symbolism of St. Peter’s Square. The obelisk is crowned by a bronze cross containing a relic of the true cross of Jesus Christ. One idea that can be drawn from this is that Christianity—the cross of Jesus Christ—conquers paganism. Another idea is that the obelisk represents the human desire for God which is only fulfilled in the cross of Christ. In the end, it is the cross towering above the square which is showcased in the place of honor. It is the cross that welcomes all the pilgrims who come to the basilica. The Latin inscription at the base of the obelisk sums up: Christus vincit. Christus regnat. Christus imperat. “Christ conquers. Christ reigns. Christ commands.” On both sides of the cross-crowned obelisk stand two fountains symbolizing the waters of salvation flowing from the cross. A great story is often told about the transfer of the obelisk in 1586. It took 900 men and 140 horses to pull the obelisk upright. On the occasion the pope issued a solemn silence as the obelisk was being raised. One sailor, however, noticed the tension on the ropes heating the cables. Risking severe punishment, he broke the papal silence, crying out “Water on the ropes! Water on the ropes!” Instead of being punished, the man was rewarded for saving the obelisk. The pope gave him the opportunity to choose some special privilege, and he chose to bring the palms from his plantation for the papal celebration of Palm Sunday. Hundreds of years later, that man’s town of Bordighera is still given the exclusive privilege of supplying the palms for the Palm Sunday liturgy at St. Peter’s. Pope Francis would have used palms from that town today.